It’s going in my kitchen, so I painted it a happy red color. Then I filled it with plastic bags and cut a piece of styrofoam to fit in the top. Realized you could see through the stars into the bags and styrofoam. Not pretty. So I hot glued a piece of canvas around the top edge to cover the stars. I added greenery that I got at Hobby Lobby and just poked it down into the styrofoam. And voila, I’ve got a colorful decoration for the top of my cabinets! So, have you spray painted anything lately? Or am I the only crazy lady walking around with a spray painted finger? Light fixtures: Okay so I just wanted to boast about the original use of the Hammered Silver spray paint I mentioned earlier…. 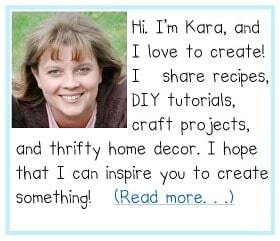 I had 2 pendant light fixtures over our kitchen table. They were brass with big glass shades. I didn’t want to buy new ones, just didn’t like the 80’s brass any more. First remove the glass and the wiring from the pendant chain. Then I painted first with Tremclad Hammered Silver to completely cover the brass. The final coat was a *light* covering with Tremclad Hammered dark grey to make a pewter color. Let some of the silver show through. Looks better than all one solid color. I also sprayed the brass pot light surrounds, but only used the Hammered Silver. Next I’m doing the antique coat hooks on the coat rail! 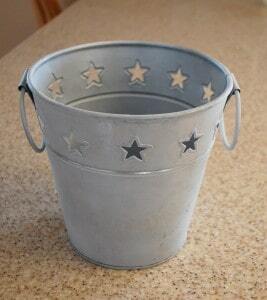 I spray painted a 7″ tin bucket too this week! Got it for 99 cents at Salvation Army. It was black and I wanted the “tin” look so I used a can of Silver Hammered-look spray paint that I had used for another project. Now the bucket looks like galvanized. 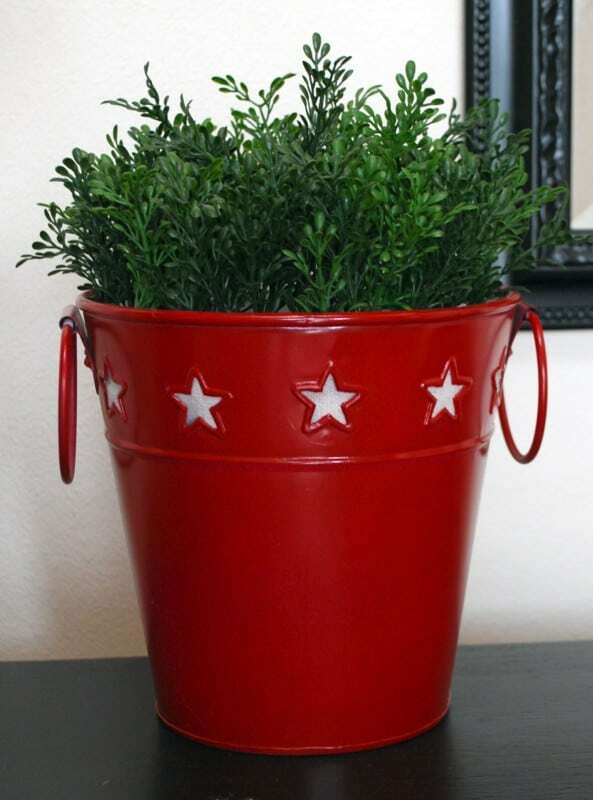 We’re using it for a 65th party and decorating with ribbons etc and alphabet stickers to read “My Bucket List”. It’s been fun using the spray paint. I love it! And I, too, can’t wait for the weather to be nice enough to play with spray paint outside. I wish winter only lasted through Christmas time! It is too, too cold for spray painting in England. I also have a whole bunch of things to sand too. C’mon weather, play the game! I love, love that red! I confess…I have spray painted twice in the garage since Saturday night. I have a problem. so happy and cute! did you have to do anything special to the metal before you painted it? i have a bigger metal tin i’d like to do that too, but don’t know if i have to “rough it up” before hand..or just primer will work? I love how it is popping with color! Thanks for introducing me to the wonders of spray paint:) I look at “trash” a lot differently ever since. Oh my gosh that is an awesome idea! I am totally going to start scouring thrift stores for a long skinny frame. I’ve gotta make one! LOVE the red!! I can’t wait for spring to come so I can get out and do some spray painting along with other things! Very cute idea! 🙂 I need to be spray painting again.